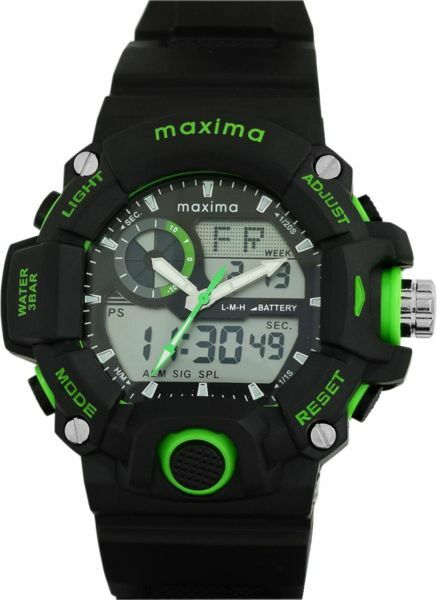 Reward the transition of your boy from high school to college by gifting him this bold, eye-catching Maxima watch. Stylish and trendy by design, this watch brings the two worlds of analog and digital together. It has a very sporty design and is ideal for casual events or everyday wear. This watch features a chronograph function which allows it to record time accurately, making it a great instrument to use as a stopwatch. The back case of this watch is constructed of stainless steel which makes it durable. In addition, it also features water resistant properties that protect the watch from rare spills of water. Attached to this stylish watch is a synthetic black-coloured, double-holed strap which complements the watch and is comfortable to wear. Featuring light and alarm functions, the watch is also useful during night outs to read the time in the dark and wake up in time in the morning.